So what’s this dark deliciousness all about? I’m sure you’re doubtful that this chocolate treat can actually have benefits? But it’s loaded with goodness. 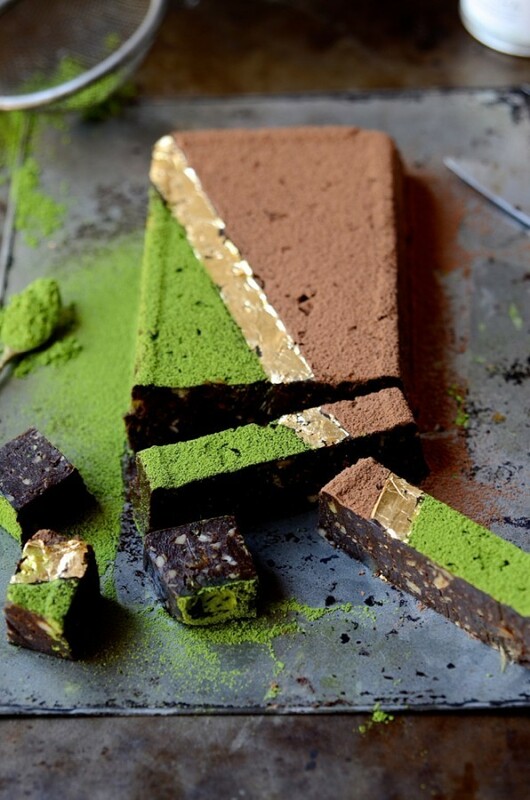 Sticky medjool dates, walnuts, dark chocolate and …… matcha green tea. 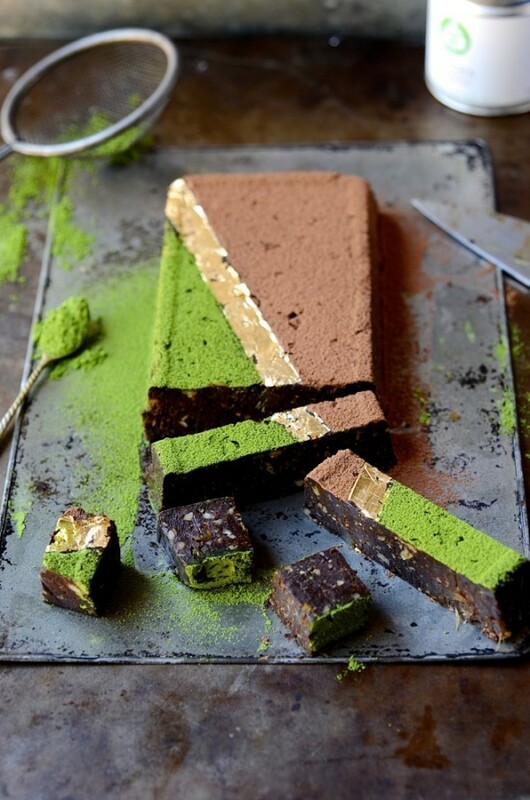 A no-bake, healthy matcha date fudge that comes together in a matter of minutes. Dates are a staple in my kitchen. I love these sticky fruits as a snack or with Greek yoghurt, nuts and a drizzle of honey. Off-hand, I can think of at least a dozen other uses for this versatile Middle Eastern delicacy. This fudgy chocolate banana bread gets a big thumbs up, as do our favourite bliss balls. Fudge as we know it, has a scandalous reputation. Understandably. Two tins of condensed milk, half a block of butter and enough sugar to make Jamie Oliver squirm! This is the type of fudge I grew up on and possibly where my sweet tooth started. I’m happy to say that this healthy fudge is a great alternative. 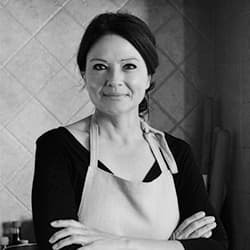 I’ve used ginger in this recipe, which is optional, but it lends a sweet heat that works so well with dark chocolate. 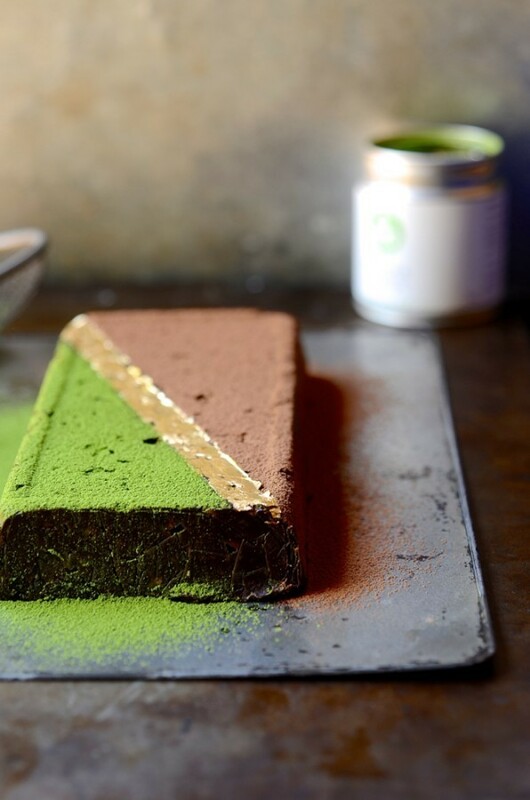 When asked by Just Matcha to come up with some creative ways of incorporating this Japanese super-power tea into everyday foods, a deluge of ideas sprang to mind, the first of which were baked donuts. 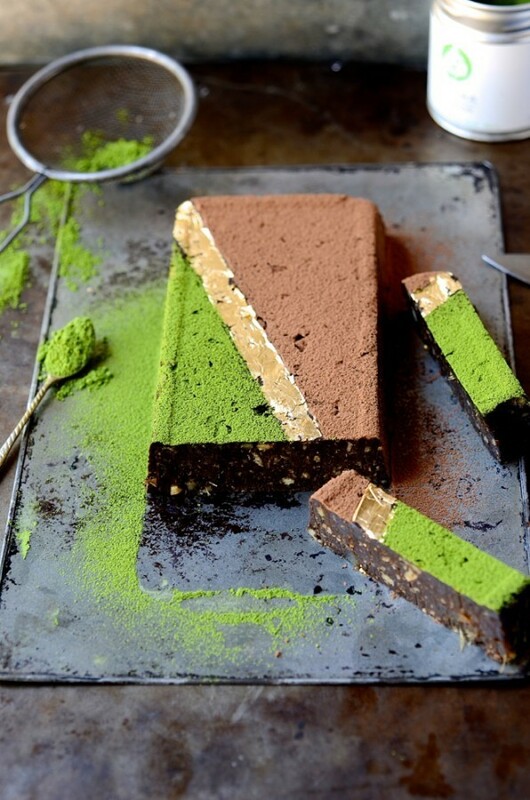 Quite honestly, I’ve been surprised at how easy it is to include green tea in savoury and sweet foods. These truffle squares keep well for up to 2 weeks, although they never quite make the best before date. I serve them with after-dinner coffees, as lunch box treats or a quick afternoon treat. Place the walnuts in a food processor and pulse for a couple of seconds. Add the dates and blitz again. Add the ground almonds, cocoa, Matcha, maple syrup, vanilla and chocolate. Pulse again until all the ingredients are incorporated. Remove the blade, add the ginger if using and mix to combine. Tip the date mixture into the loaf tin and press down firmly. Fold over the extended clingfilm edges and chill for several hours until firm. Turn out onto a board and dust with cocoa or matcha green tea to finish. So clever – love the look of this ! Jeez, that does look good. We’re quite addicted to it now. Thankfully it’s full of the good stuff! And how easy? Anything with medjool dates and you know it’s going to be good! Quite St Patrick-ish, right? Lumo deliciousness. Thanks Hein. Very ‘Shrek’ but so good! Could you tell me what vanilla paste is? This sounds super delicious! Hi Alex. The paste is simply a concentrated version of vanilla extract. It’s thick in consistency and filled with thousands of vanilla seeds. If you can’t find paste, extract will also do the trick.